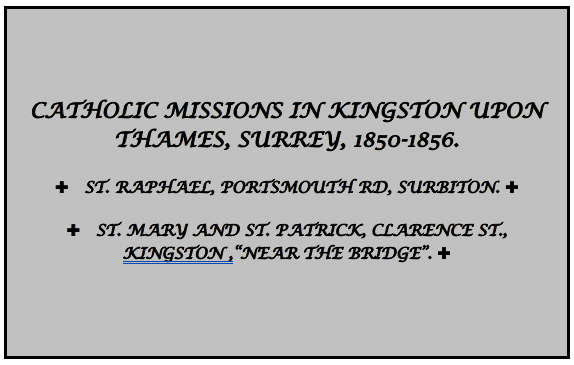 The first mission in Kingston upon Thames, mentioned in the Catholic Directory, was St. Raphael’s Church, in Surbiton. Built by Alexander Raphael [see www.kingstonhistoryresearch.co.uk], this opened on 1 September 1850 and flourishes today as a Catholic parish. A second Kingston mission, with a chapel and a school, was that of St. Mary and St. Patrick. The Directory recorded that it opened on 10 April 1853 and closed between 1855-1856. The Religious Census of 1851 recorded that the parish priest and chaplain of St. Raphael’s, then owned by Edward Raphael, the nephew of Alexander Raphael, was Fr. Jeremiah Donovan and it appeared that the church was open only on Sunday morning. An appeal for funds to support SS. Mary & Patrick indicated Diocesan concerns that the Catholic residents of Kingston were “dependent for their spiritual requirements on the pleasure of a private gentleman” and that the children were denied moral training because the schools provided by Alexander Raphael were not open. This evidenced the need for a second mission in Kingston. The Directory recorded that throughout its existence the priest at SS. Mary & Patrick was Fr. Henry Clark. He was a very active and dedicated man. The Directory recorded also that in 1855 the priest at St. Raphael’s was Fr. James Doyle. Both served as military chaplains in the Crimean War and both suffered poor health as a consequence. Shortly after he returned to Kingston, Fr. Doyle died of a heart attack, possibly on church premises, on 29 July 1855. A report of his death in the Surrey Comet, a local newspaper, said that his “life was a constant practical exemplification of real Christian virtue”. Martin Corkery  concluded that SS. Mary & Patrick’s mission closed because funding for its support was not forthcoming. However, a hypothesis emerged that the mission closed because, before or shortly after Fr. Clark went to the Crimea, an accord was reached between the Diocese of Southwark and Edward Raphael, the owner of St. Raphael’s Church and its associated schools, whereby they could be opened to provide all the services necessary for the expanding Catholic population of Kingston, with Fr. John Ainsworth as the priest. More research is needed to explore this hypothesis.